The Gorham businessman says he will reach out to his primary competitors in the Republican Party, which he joined in October, and voters won't liken him to Gov. LePage or President Trump. 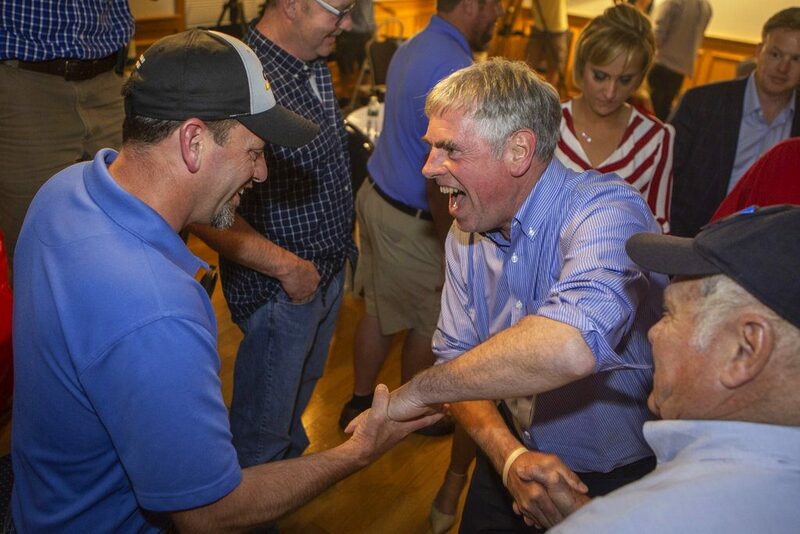 Maine Republican gubernatorial primary winner Shawn Moody is congratulated by supporters in Gorham on Tuesday night. Shawn Moody says he plans to move quickly to build support in the Republican Party that he joined eight months ago and reach out to lawmakers who supported others in the four-way gubernatorial primary that he dominated Tuesday. Moody captured the party’s nomination in stunning fashion, as he quickly took and never relinquished a dominating lead in an election that featured two state lawmakers and a former member of Gov. Paul LePage’s inner circle. With 90 percent of the precincts reporting Wednesday evening, Moody had strong majority support with 56 percent of the vote. He told supporters who gathered at his auto-body business center in Gorham on Tuesday night that Republican voters clearly want a business person, not a political insider, occupying the Blaine House, and he remarked on how he was consistently winning in all corners of the state. “North, south, east and west, it’s about all of us, it’s about Mainers and we are going to take our state back,” he said. On Wednesday, Moody said his “take our state back” comment referred to how out-of-state groups have used Maine’s initiative and referendum process to enact laws at the ballot box and sidestep the Legislature. Moody’s victory Tuesday gives Republicans a head start on the fall general election campaign, as the front-runner in the Democratic primary, Maine Attorney General Janet Mills, did not capture more than 50 percent of the vote. That means the Democratic race will be settled by a retabulation of ballots under Maine’s new ranked-choice voting law, a process that could take several days. Republicans in Maine and nationally were quick to seize on Moody’s victory. The Republican Governors Association, based in Washington, D.C., also issued congratulations to Moody, viewed by supporters as a plain-spoken outsider who is similar to LePage in his life story of growing up poor, pulling himself to success as a self-made businessman. Maine Democrats, who had made Moody a prime target of their criticism in the run-up to Tuesday’s vote, also were quick to react to Moody’s victory. All four Republicans in the primary tried to align their positions with LePage and show how they intended to carry on his agenda of cutting taxes, shrinking government and reforming welfare. Moody’s outsider message seemed to resonate the most with primary voters, often the most dedicated and conservative members of a political party’s base. Democrats were also quick to suggest they had the momentum in the race as their slate of seven candidates in the primary drew more Democratic voters to the polls than the Republicans mustered Tuesday. Early results indicated 30,000 more people voted in the Democratic primary than in the Republicans contest. Moody said that as a Republican, he supports President Trump on a number of key policy issues, including lowering business taxes and trying to secure the U.S. borders – but he wouldn’t be branded as having the same flame-throwing personality of Trump or even of LePage, who has repeatedly made headlines for blunt public statements.